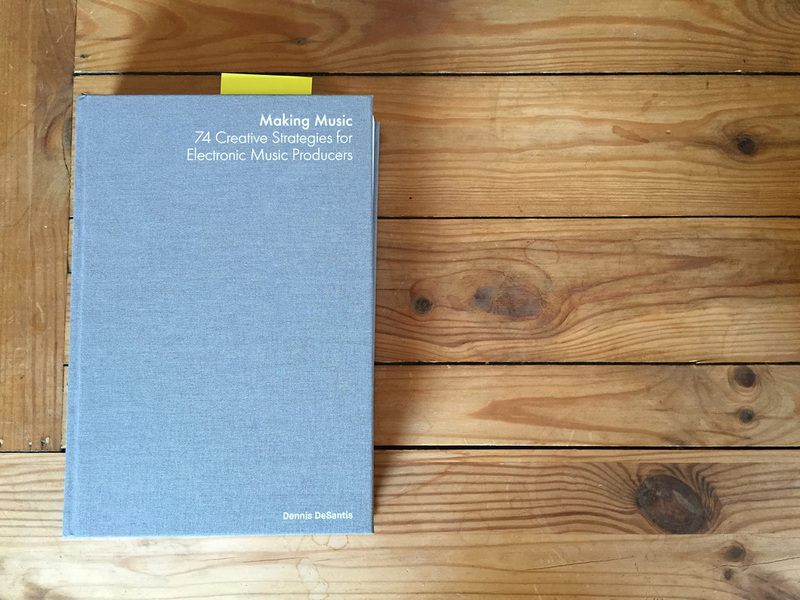 Making Music - 74 Creative Strategies for Electronic Music Producers is a 340+ pages long book published by Ableton, which sets the focus on creativity, productivity and procrastination when making music. The book tackles both practical and mental obstacles you usually face when getting stuck or feeling less inspired. For example, you might have created lots of short two-bar musical ideas and you cannot seem to put the parts together and form something of a complete track - or you having problem getting started. Or even finish it. After a couple of years of practically no music making, this book helped me get back on track. As a sound designer, I am by nature a total sucker for anything sounds. New plugins, sound libraries, new and old gear. But this passion have more and more become the dominant part in my music life, and the ease I usually was building tracks with has gradually become less. In fact, at times I started to feel almost alien to actually make anything else than short loops. Combine that with a severe condition of the Gear Acquiring Syndrome, this led me into a circle of buying even more new stuff. You know - you're getting sucked in by cool YouTube videos and you're telling yourself, OMG - this is the last piece of the puzzle! If I have THIS I'll be able to make the music I want in a focused manner. But as we all know, behind that purchase just lies another one, and another one. I'm really not saying that buying new stuff is bad. Buying new gear is cool and equally essential for me as my wife buying new shoes. But in my case, GAS took over big time. This book gave me a double-punch that helped me open the door of making music again. First and foremost - the book itself is brilliant. Already after the 10-15 first pages, I started to feel an itch to close the book and try out some of the ideas. Secondly, in the introduction the author mentioned a book called The War of Art by Stephen Pressfield. This book is pretty short, but totally nails it when it comes to the subject of procrastination. What I really appreciate is the straight-forward tone. Always to the point. Problem - approach - solution. or explaining how to use a computer mouse. Making Music comes both as a physical book and an eBook, and I ended up buying both. The physical book is of very high quality. It feels very nice in your hand and has a beautiful retro quality over it. The eBook is great if you are having a tablet sitting next to your music computer and you need some quick inspiration when working with music. This book is exceptionally well written, contains an insane amount of wisdom and points out solutions to problems like a laser. Even though it deals with issues in a general sense, it always contains some idea that help you to move forward. Easily my best purchase of 2015. If you really want to earn the black belt and beat the beast of procrastination - go to Amazon and grab a copy of The War of Art when you're at it. These two books compliment each other very well. Price: 25 euro for the printed version. 10-15 dollars for the e-book. Where to buy: Ableton, iBooks, Amazon Kindle. Score: 5 out of 5 points. Essential. The E-mu Command Stations were the last really cool things that were coming out from the decaying E-mu brand. The Command Stations were released around 2001 and are basically a Proteus 2000 with a bunch of knobs and drum pads. Here is a 10+ minute demonstration of the MP-7 model. Want to grab some cool sounds for free? We have - finally - reopened our section with free sounds. So far we have only one item - but it's a quite cool little instrument, combining the sound of the Ensoniq ASR-10 sampler, u-he Diva and a very rare resonant filter from Waveboy Industries. Keep your eyes peeled for more freebies. We have many cool things planned, including a collection of sounds of what happened to a poor usb dongle. More about this later, but for now let's just say we're no longer fans of this type of software protection and it got what it deserved. We'll also be adding all those free libraries from our sister label Fingerpushers. If you want to get notified when we release new freebies, reviews or videos - do subscribe to our RSS newsfeed. You can find the feed to the right. Hello and welcome to the new Plughugger.com web. Apart from the new design there are a few major changes that I would like to tell more about. New shopping system. This is the big one. We've left the murky world of Joomla and servers all over the world to an e-commerce solution by E-Junkie. This has many benefits, among them a shopping cart, less download links caught in spam filters and instant redirection to a page with downloads after payment. The only downside is that we don't have so much control over the layout of some parts of the system. But compared with the much smoother operation - that's a minor thing. The review part of the site is going to be revived. The music tech magazine I've been working for ten+ years is no more. The reviews on this blog will be fewer, but more hands on and there will be a healthy focus on old funny hardware gizmos and equipment. I think this will develop into a fantastic resource of production knowledge and music tech geekery. Fingerpushers - our sister site focusing on samples - have been assimilated into Plughugger. No comments. It's sad but I've had enough of spam-bots and people who are asking for pirated versions on this blog and Youtube. Sadly this is a trend on the whole net right now and I have zero time or tolerance for any mickey-mouse bs. Freebies. Keep your eyes peeled. There are some extremely cool stuff coming out 2015 that won't cost you a penny. Thanks - and the best to all of you. Happy holidays!